Muhammad Jameel Khan was a noted linguist, critic, writer, and scholar of Urdu literature and linguistics from Pakistan. He also was Vice-Chancellor at the University of Karachi. Yolki-palki or is a 1989 Soviet satirical film based on novels by Vasily Shukshin, directed by Sergei Nikonenko. Chet W. Coppock was an American radio broadcaster, television broadcaster, sports talk personality and author based in Chicago. His fifth book “Chet Coppock: In Pursuit of Chet Coppock” was released in July 2018. Coppock hosted the Chicago Blackhawks Heritage Series, and emceed corporate sponsorship events for the Blackhawks featuring former NHL stars such as Bobby Hull, Tony Esposito and Denis Savard. WMAQ was an AM radio station located in Chicago, Illinois, United States, and broadcast at 670 kHz with 50,000 watts. The station was in existence from 1922 to 2000, and was the oldest surviving broadcast outlet in Chicago. It was a class A clear channel station, and could be heard, particularly at night, over most of the eastern United States. WMAQ was owned in its later years by CBS Radio, but for much of its life it was owned by the National Broadcasting Company (NBC), and later Westinghouse Broadcasting. The station's original owner was the Chicago Daily News newspaper, but its longest-running ownership was as an NBC Radio owned-and-operated station. Its transmitter was located in Bloomingdale, Illinois just off Army Trail Road, with a 238-meter (780-foot) tower where it remains today, with the callsign still on the exterior facade. The AM 670 transmitter is now in use by WMAQ's successor, All Sports Radio WSCR, and remains under the ownership of Entercom, which merged with CBS Radio in 2017. WSNS-TV, virtual channel 44, is a Telemundo owned-and-operated television station licensed to Chicago, Illinois, United States. The station is owned by the NBC Owned Television Stations subsidiary of NBCUniversal, as part of a duopoly with NBC owned-and-operated station WMAQ-TV ; NBCUniversal, a Comcast subsidiary, owns both networks, along with regional sports network NBC Sports Chicago. WSNS-TV and WMAQ-TV share studio facilities and business offices at the NBC Tower on North Columbus Drive in the city's Streeterville neighborhood, and transmitter facilities atop the Willis Tower on South Wacker Drive in the Chicago Loop. The Kossuth Prize is a state-sponsored award in Hungary, named after the Hungarian politician and revolutionary Lajos Kossuth. The Prize was established in 1948 by the Hungarian National Assembly, to acknowledge outstanding personal and group achievements in the fields of science, culture and the arts, as well as in the building of Socialism in general. Jörg Demus was an Austrian classical pianist, who appeared internationally and made many recordings. He was also a composer, and lecturer at music academies. In composition and playing, he focused on chamber music and lied. He played with singers such as Elisabeth Schwarzkopf and Dietrich Fischer-Dieskau, as a piano duo with Paul Badura-Skoda, and with string players such as Josef Suk and Antonio Janigro. Demus was instrumental in bringing the historic Hammerflügel to concert podiums. He is a member of the Legion of Honour, among many awards. He is regarded as one of the leading Austrian pianists after World War II. Dale Denno was an American politician from Maine. Warren Adler was an American author, playwright and poet. His novel The War of the Roses was turned into a dark comedy starring Michael Douglas, Kathleen Turner and Danny DeVito. The War of the Roses (1981) is a novel by Warren Adler. 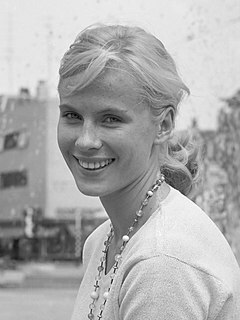 Berit Elisabeth Andersson, known professionally as Bibi Andersson, was a Swedish actress who was best known for her frequent collaborations with filmmaker Ingmar Bergman. Wild Strawberries is a 1957 Swedish drama film written and directed by Ingmar Bergman. The original Swedish title is Smultronstället, which literally means "The wild strawberry patch" but idiomatically signifies an underrated gem of a place, often with personal or sentimental value. The cast includes Victor Sjöström in his final screen performance as an old man recalling his past, as well as Bergman regulars Bibi Andersson, Ingrid Thulin, and Gunnar Björnstrand. Max von Sydow also appears in a small role. Bergman wrote the screenplay while hospitalized. Exploring philosophical themes such as introspection and human existence, Wild Strawberries is often considered to be one of Bergman's greatest and most moving films. ↑ William Joseph "Bill" LeCaine Sr.
↑ One of the last surviving Hmong war heroes has died. Lt. Col. Youa True Joseph Vang, 83, settled in St. Paul. ↑ Paul J. Coleman Jr.